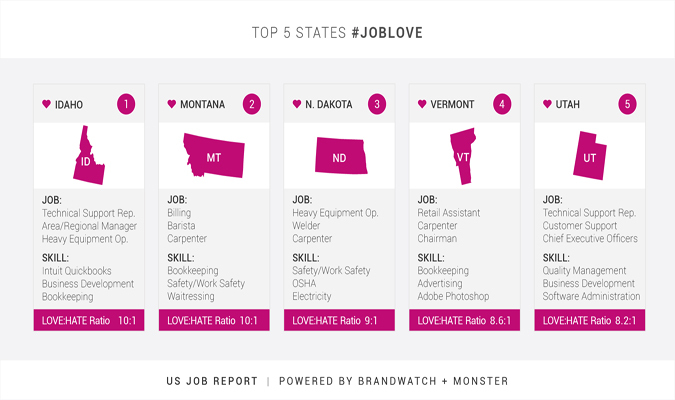 Monster and Brandwatch announced on July 12 the results of their second annual Monster and Brandwatch Job Report, a social media study of job sentiment and corresponding interactive infographic on the insights. Revealing where people love and hate their jobs the most in the U.S., the study also analyzed exactly who, what, when, where, and why people take to Twitter to discuss how they feel about their jobs, and how those findings differ from the 2015 report. See the full release to learn about how Americans feel about their jobs. Interested in receiving more workplace and lifestyle news like this? Sign up for PR Newswire for Journalists and create a free profile to get press releases sent to you on the topics you cover. Get started now. WME | IMG announced on July 11 the acquisition of UFC, the world’s premier professional mixed martial arts (MMA) organization. A global leader in entertainment and sports with a portfolio of more than 800 owned, operated and/or commercially represented events, WME | IMG will also serve as UFC’s operating partner. WME | IMG, which has a proven track record of building leading sports brands, will focus on accelerating the sport’s popularity and presence around the world. Silver Lake Partners and KKR will join WME | IMG as new strategic investors, along with MSD Capital, L.P. and MSD Partners, L.P., which will provide preferred equity financing. See the full release to learn more about the deal and the future of UFC. Interested in receiving more press releases like this? Sign up for PR Newswire for Journalists and create a free profile to have news emailed to you about health and safety issues. Get started now. During the next year, selected members of the literary community will travel on Amtrak routes that crisscross the country and spend the time working on their writing projects, providing a unique journey and workspace as part of the #AmtrakResidency program. This is the second group of writers selected for the program, which offers a travel experience with amazing scenery, an environment that fosters engaging connections, and the ability to explore and be inspired by the diversity of landscapes America has to offer. See the full release to learn more about the program. Don’t miss other news about travel or publishing like this. Sign up for PR Newswire for Journalists and create a free profile to have press releases emailed to you on the topics you cover. Get started now. Avid Life Media, the company that owns and operates Ashley Madison, is rebranding as ruby Corp. and repositioning its Ashley Madison flagship brand. “It’s a new day at ruby and renaming our topco is an important step in our journey to completely rebuild the company as a relevant, digital dating innovator that truly cares for our customers,” explains newly appointed ruby CEO Rob Segal. See the full release to learn more about the repositioning. Interested in receiving more entertainment and business news like this? Sign up for PR Newswire for Journalists and create a free profile to get press releases sent to you on the topics you cover. Get started now. The National Safety Council urges pedestrians to exercise caution while playing the Pokémon Go augmented reality game, and the council implores drivers to refrain from playing the game behind the wheel. Distraction is a well-documented threat to safety, both on foot and on our roads. Distracted walking has contributed to more than 11,000 injuries in the last decade; distracted driving has killed thousands. Every single injury and death could have been prevented if pedestrians and drivers stayed alert and prioritized the task at hand. See the full release to see more about distracted walking and distracted driving. Interested in receiving more press releases like this? Sign up for PR Newswire for Journalists and create a free profile to have news emailed to you about games and other topics you cover. Get started now.